It is challenging to put the Kentucky Derby into words. It is much more than simply a horse race. The event is nothing short of spectacular. To fully understand and appreciate, you should purchase tickets and attend the next event. The week of the KD has numerous special events and activities. Although the list of days and events appears to grow, here is a brief summary. The Kentucky Derby is a massively popular international spectacular. The Kentucky Derby is a horse race held annually in Louisville, Kentucky, United States, on the first Saturday in May. The Longines Kentucky Oaks is America’s premier and most lucrative race for 3-year old fillies – female horses - held each year on the day before the Kentucky Derby. The race was established on May 19th, 1875, by the same founder of the Kentucky Derby, Colonel Meriwether Lewis Clark, and is modeled after the British Epsom Oaks. The day of the Longines Kentucky Oaks is referred to as Kentucky Oaks Day at Churchill Downs is the fourth highest attended horse race in the United States – following the Triple Crown of racing; the Kentucky Derby, the Preakness Stakes, and the Belmont Stakes. During Kentucky Oaks Day, the historic racetrack is decorated in pink bunting and the more than 100,000 guests are asked to prominently incorporate pink into their attire in an effort to raise funds and drive national attention to the fight against breast and ovarian cancer. Thurby has become an additional day of celebrating the fantastic week that leads up to the Kentucky Derby. It is our understanding that the name was developed by locals in the Louisville, Kentucky area and became a day for locals to enjoy the races prior to the enormous crowds of non-locals that attend the race on the following Saturday. Although started by locals, Churchill Downs has also embraced the term of Thurby. Here is a partial screen shot from their website from September 23, 2016 referencing the Thurby race day that will take place at the track on May 4th, 2017. In 1872, Col. Meriwether Lewis Clark, Jr., grandson of William Clark of the Lewis and Clark expedition, traveled to England, visiting the Derby, a famous race that had been running annually since 1780. From there, Clark went on to Paris, France, where in 1863, a group of racing enthusiasts had formed the French Jockey Club and had organized the Grand Prix de Paris at Longchamp, which at the time was the greatest race in France. Returning home to Kentucky, Clark organized the Louisville Jockey Club for the purpose of raising money to build quality racing facilities just outside the city. The track would soon become known as Churchill Downs, named for John and Henry Churchill, who provided the land for the racetrack. Officially, the racetrack was incorporated as Churchill Downs in 1937. The Kentucky Derby was first run at 1 1⁄2 miles (2.4 kilometers), the same distance as the Epsom Derby. The distance was changed in 1896 to its current 1 1⁄4 miles (2.0 kilometers). On May 17, 1875, in front of an estimated crowd of 10,000 people, a field of 15 three-year-old horses contested the first Derby. The race is a Grade I stakes race for three-year-old Thoroughbreds at a distance of one and a quarter miles (2 km) at Churchill Downs. The race is known in the United States as "The Most Exciting Two Minutes In Sports" or "The Fastest Two Minutes in Sports" for its approximate duration, and is also called "The Run for the Roses" for the blanket of roses draped over the winner. It is the first leg of the American Triple Crown and is followed by the Preakness Stakes, then the Belmont Stakes. Learn about the Kentucky Derby and Churchill Downs. Note: Churchill Downs, Kentucky Derby, Kentucky Oaks, the “twin spires design”, and Churchill Downs Incorporated related trademarks are registered trademarks of Churchill Downs Incorporated. 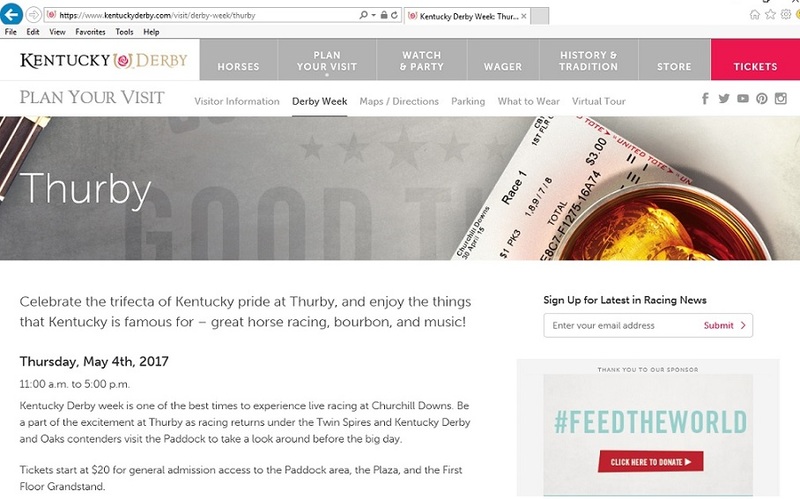 This Therby.com website is NOT associated with Churchill Downs. We are simply fans of Churchill Downs and the activities that take place in Louisville, Kentucky.